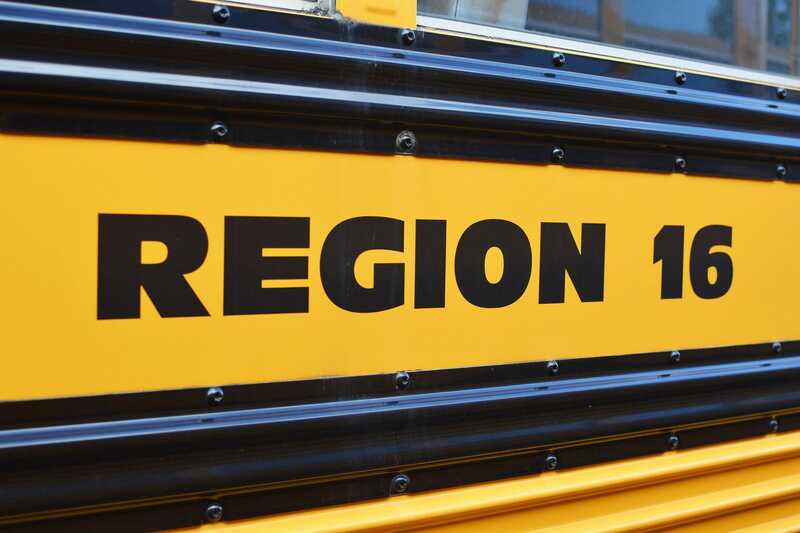 The school bus routes for Region 16 Schools are listed under the town where you live and the school that your student will be attending. You can find bus routes here. If you have an issue or concern about your student’s bus stop location, please contact the student’s school principal or All-Star Transportation’s Seymour office at 203-888-8816 or by email [email protected]. Parents/caregivers should check the school district website for information about early dismissal days (for example: conferences and early release days). A list of Region 16 school hours can be found below. Woodland Regional High School – 7:35 a.m. – 2:05 p.m.
Long River Middle School – 8:05 a.m. – 2:35 p.m. Prospect Elementary School – 8:45 a.m. – 3:15 p.m.
Laurel Ledge Elementary School – 8:45 a.m. – 3:15 p.m.
H.A.W.K.S. Alternative Education – 2:35 p.m. – 5:30 p.m.
Woodland Regional High School – 9:35 a.m.
Long River Middle School – 10:05 a.m.
Laurel Ledge Elementary School – 10:45 a.m.
H.A.W.K.S. Alternative Education – 2:35 p.m.
Woodland Regional High School – 11:35 p.m.
Long River Middle School – 12:20 p.m.
Laurel Ledge Elementary School – 1:00 p.m.
Out-of-District schools include Kaynor Tech, Nonnewaug, Emmett O’Brien and special needs transportation. Should weather and road conditions prompt the superintendent to close or delay Region 16 schools, all buses scheduled for out-of-district schools will follow Region 16’s schedule for that day (2-hour delay or no transportation because schools are closed). The superintendent’s decision is made with the safety of students in mind, and the bus company will abide by the call. Beacon Falls students get picked up by bus 23, except for those students who live in the Beacon Valley Road area. Beacon Valley Road-area students are picked up by a school van from All-Star’s Prospect terminal. The van meets bus 23 at the commuter lot in Beacon Falls on North Main Street, where students transfer from the van to the bus. Bus 23 then continues to Emmett O’Brien. In the afternoon, all Region 16 students get picked up at Emmett by bus 23. At the end of the route, bus 23 meets vans from the Prospect terminal at the commuter lot in Beacon Falls. The vans take Prospect students and Beacon Falls student who lives in the Beacon Valley Road area to their designated stops. Any individual seeking a permanent change to a student’s pick-up and / or drop-off procedure must contact their student’s school principal, or All-Star Transportation’s Seymour office at 203-888-8816 or email [email protected]. All pre-k and kindergarten students will be dropped-off at their assigned bus stops and must be met by a parent or an authorized adult / caregiver, or the student will be returned to his / her school. However, for grades 1 through 5, if a parent or other authorized adult/caregiver that is usually present when a student is dropped off is not there, that student will be brought back to school. If a student is uncomfortable when getting off at his or her bus stop, that student also will be returned to school. It is advisable for parents to inform the school and bus company in writing if they want their child to be dropped off at their bus stop without an adult present. If for some reason a student needs to ride a different bus on a certain day, a note signed by his / her parent or guardian must be handed in to the student’s homeroom teacher at the beginning of the school day. This note must state the number of the bus the student currently rides, and the number of the bus the student is requesting to take. Failure to do this will prevent the request from being granted. Phone requests should be limited to emergency situations only. 3. Students should wait for the school bus to come to a complete stop and for the doors to open before approaching the bus. (Wait for the driver to nod). Beacon Falls – If you have any questions, contact All-Star Transportation’s Seymour office at 203-888-8816 or email [email protected]. Prospect – If you have any questions, contact All-Star Transportation’s Prospect office at 203-758-5989 or email [email protected].